Our Heart’s Hero formed out of necessity when two friends from just such a small town in the middle of nowhere decided that somebody needed to be playing some inspired rock ‘n’ roll. “In the small town area where we lived there weren’t a lot of great worship bands around,” explains front man, Nick. “Christian radio didn’t exist in our town. All we had was the junk on MTV. We saw a void and thought maybe we could fill it.” Still only sophomores in high school, Nick Joyce, his buddy Jeremy McKnight, and Gabe White grabbed some other guys and started messing around, eventually developing a sound that was bright and poppy with an underlying rock ‘n’ roll streak, wrapped around a message of hope and encouragement. Adding Derrick Bishop and Dave Harris to the band's membership, the five moved to Nashville, Tennessee in hopes of learning more about turning the hobby they had started into a full time career. During this time, the band released it's first EP (The Dizzy EP, 2002). As the band continued to grow and change, Derrick returned to medical school at Marshall University in Huntington, WV and Dave moved on to other musical aspirations, including road tech-ing for country music powerhouse "Lonestar". Nick, Jeremy and Gabe changed the band's name to "Our Hearts Hero" to officially kick off the birth of a new sound and a new band. 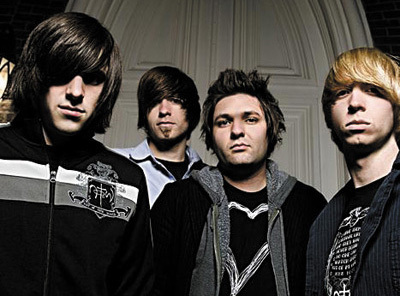 In 2004, the newly named "OHH" headed into the studio to simultaneously record their debut album (Can You Hear Me, 2004) as well as an all-worship album (Our Hearts Hero: Worship, 2004). The three then ventured west, to one of California 's premier Christian camps, Hume Lake, to lead worship for the summer. As the band's fall, winter and spring touring schedule grew increasingly busy. Gabe stepped down from the band to marry his now wife, Jennifer. Nick and Jeremy teamed up with longtime friends, twin brothers Hayden and Hunter Lamb, from Franklin, TN. The foursome toured a rigorous nation-wide schedule over the next year and a half, racking up well over 100,000 miles on the road. The band then released their 3rd full length project (Our Hearts Hero: LIVE in California ). In late 2005, Hunter Lamb received and accepted an offer to play guitar for Atlantic Record's "Paramore". Then in early 2006, Hunter's brother Hayden excepted an offer from Provident Music's "Red" where he currently serves as drummer. Filling Hunter's guitar position is Jason Nattier, from Ashland, Kentucky . Ricky Holbrook, Grayson, Kentucky, stepped into Hayden's spot on the drums in the Spring 2006. Signed with Gotee Records, Our Hearts Hero released their self-titled debut album in September of 2007. Hailing 11 songs of heartfelt, soaring pop-rock, all penned by lead vocalist, front-man, and guitarist, Nick Joyce, this must-hear album contains a combination of Nick’s soulful, emotion-laden vocals set against a backdrop of smart and spunky pop-rock melodies. There is a healthy dose of encouragement in the lyrics too. The first radio single released by Gotee Records, "Back to the Cross", peaked at Number 22 on the national charts and landed at 77 on the CRW Year End Top 100 list for AC Adult Contemporary on nationwide Christian Radio.